Find out when you can see the film and get new pictures courtesy of Edinburgh International Film Festival. 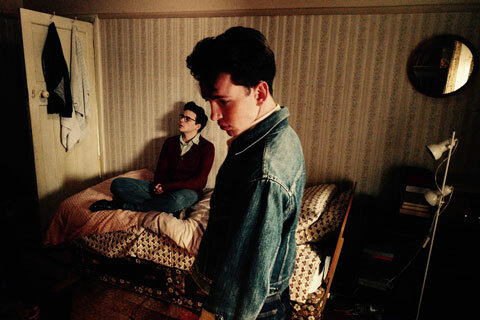 Morrissey biopic England Is Mine has been given a date for its worldwide premiere. The Mark Gill-directed film, which is set to focus on the early years of The Smiths frontman, will be screened on the last day of the Edinburgh International Film Festival on Sunday 2 July. The festival's website also debuted new pictures from the biopic, which stars Jack Lowden (Dunkirk, War And Peace) as a young Stephen Morrissey. Here Lowden portrays the Cemetry Gates singer alongside Jessica Brown Findlay, who plays his young friend the punk poet Linder Sterling. And because every coming-of-age biopic needs a moody bedroom scene... here's Lowden with Laurie Kynaston, who plays a young Johnny Marr. Tickets for the premiere go on sale from Friday 12 May at 10am.